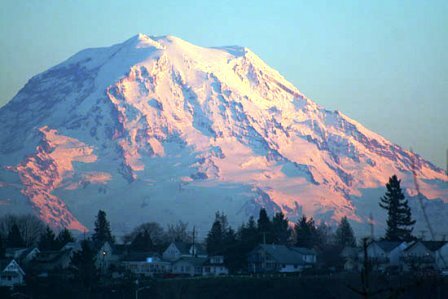 Over the next few days I hoping to cup a lot of great coffee, do an espresso bar/coffeehouse crawl and get some views for my soul – Mt Rainier (if it isn’t raining). Wednesday, I head to Olympia, WA to spend some time with the folks at Batdorf and Bronson. I will be sending you guys “blogcards” instead of postcards of my coffee experiences and travel. BTW, we are staying in this really amazing B&B called Fertile Grounds. The owners of Fertile Grounds are passionate about green, sustainable living. Back in the 1990’s and after the State of Washington designated the City of Olympia as a model for sustainable living, the owners established Fertile Grounds as a model site. In order to financially sustain this model, in 2000 they turned the house into a B&B – green and smart! I’m sure we will have plenty to say about our totally eco-friendly accommodations and look forward to spending time with these folks learning about many different ways to support the environment back in our own community. Now, how groovy is Olympia! Check out their web site. Ooh. Sounds like an exciting adventure. Can't wait to hear about it!